One year I was desperate for a Valentine’s Day gift, and I bought my husband (before we were married) a star from the International Star Registry. I just found out it’s not scientifically recognized, the star called “Spankie” is only named in this company’s books. Yeah, I know I’m a sap. At least I’m not the only one, though. Apparently Nicole Kidman bought one for Tom Cruise way back when, so did Winona Ryder for Johnny Depp. The company was founded in 1979, and they have sold over a million stars. Really, all they’ve sold is over a million certificates that say a star has been named for you (fine print supposedly says its only named at the international star registry), along with a booklet that explains the constellation in which your star is located. Apparently, the International Astronomical Union is the only body authorized to name astronomical bodies. Since there are around a trillion stars in this galaxy alone, this company has a long way to go before they are “sold out”. They claim they are not trying to mislead people, and have been given a clean bill of health by the Illinois Attorney General. • Copy of the Declaration of Ownership filed with the United States, the USSR and the United Nations. The website says it has sold over 300 million acres of land on the moon since 1980. What the hell! That means they have made $9 billion dollars?!!? Can this be? Why haven’t I heard of this before? There’s a warning on the website that says if you don’t buy from them you could be buying a worthless piece of paper. Uh huh. 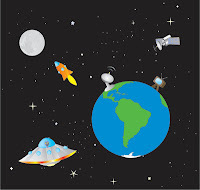 The company says: "The UN Outer Space Treaty of 1967 stipulated that no government could own extraterrestrial property. However, it neglected to mention individuals and corporations. Therefore, under laws dating back from early US settlers, it is possible to stake a claim for land that has been surveyed and register it with the US Government Office of Claim Registries. In 1980, that is exactly what Dennis Hope did for land on the Moon as he established the Lunar Embassy to parcel and sell documented acres. The Lunar Embassy was obligated to inform the General Assembly of the United Nations, the US Government, and the Russian Government in writing of the claim and legal intent to sell extraterrestrial properties. These governing bodies had several years in which to contest the claim and they never did. This allowed Mr. Hope to take the next step and copyright his work with the US Copyright Registry Office and begin selling actual deeds for the land on the Moon. Probably the biggest support of Mr. Hope's claim has been in the form of actual Lunar land owners such as two former US presidents, NASA employees and many well known celebrities."